As is the case throughout North America, the very earliest inhabitants of what is now Ludington were the Native Americans. The Ottawa tribe settled near Pere Marquette Lake, which was named after Father Jacques Marquette, a Jesuit missionary who passed away on the shoreline in 1675 on his way to St. Ignace. Burr Caswell and his family arrived in 1847, the first permanent white settlers. It was a harsh wilderness of densely populated forests with no incoming roads. It was evident by all the pines that this area would make its mark from lumber. Over the years, numerous mills popped up along Pere Marquette Lake, but because the channel was so shallow, there was no way to get the lumber out to cities like Chicago and Milwaukee. James Ludington entered the picture around 1854. He was a businessman in Milwaukee who took possession of property in Ludington that someone had defaulted on. He went into business with Charles Mears, another powerful man that had visions for the city. Ludington had Mears run his sawmill, in exchange for developing the channel...making it wider and deeper. Unfortunately for Mears, once his two-year contract was up, Ludington once again took control of the mill and had a newly improved channel in which to move his lumber. Mears was out of the picture, but was successful in his own right with many other mills in Pentwater and the Village of Lincoln. The state park in Pentwater was later named for him. 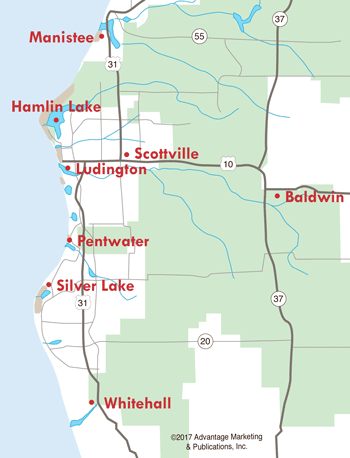 In 1873, the city of Ludington was chartered, due in part to James Ludington and the money that he put into the cause. Another major player in Ludington's development was Eber Ward. The Ludington Lumber Company donated property to Ward's idea of getting a railroad into town. Ward himself secured some of this property and built two mills. He was also a proponent of developing a permanent link across Lake Michigan from Ludington to Wisconsin. He died before seeing his dream come to fruition, but in the years to come, Ludington's harbor would become home to the largest carferry fleet in the country. 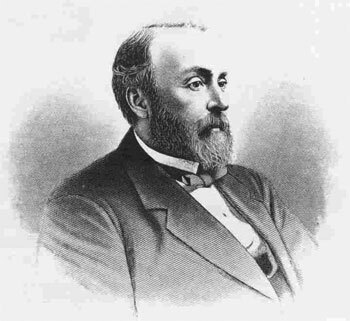 In addition to James Ludington, the other influential figure in Ludington's history was Justus Stearns. The name may sound familiar, as both Stearns Motor Inn and Stearns Park and both names for him. Former companies that also bore his name were The Stearns Lighting & Power Company and the J.S. Stearns Salt and Lumber Company. He ran the Epworth Hotel for ten years and was known as a caring and involved employer. In the early 1900s, the need for a hospital in Ludington prompted Justus Stearns to open his own home for use as a hospital. In 1907, the Paulina Stearns hospital opened, named for his wife. Justus Stearns continued to support the hospital in the years to come, often stopping in and paying bills himself. Throughout history, 14 carferries have called Ludington home...including 9 Pere Marquette vessels, City of Saginaw, City of Flint, City of Midland, S.S. Spartan and the only one still in existence...the S.S. Badger. It all began in the late 1800s...first as a way to ship cargo across Lake Michigan, and later in the 1920s when railroads used the carferries extensively during the war. Ludington's carferry history almost came to an end in 1991, but was saved by local native Charles Conrad, who crossed the lake numerous times as a youth and loved the carferries. 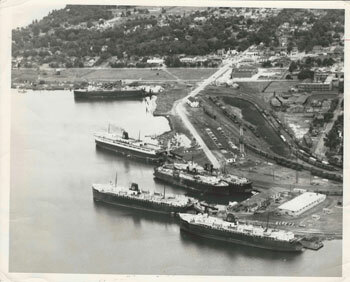 Conrad purchased the three remaining ships...the City of Midland, S.S. Spartan and S.S. Badger and resurrected cross-lake service between Ludington and Manitowoc. The City of Midland took its last voyage in 1988 and was converted to a barge. The S.S. Spartan is docked in Ludington and is used for parts for its sister ship the S.S Badger, which is owned by Lake Michigan Carferry and is on the National Register of Historic Places. Click here for more information on carferry history. There's no other place in Ludington that depicts Mason County's history better than Historic White Pine Village. Set upon 13 acres overlooking Lake Michigan, this village contains many of the original buildings and truly shows what life was like in the 1800s. Many special events take place at the village from spring until fall, including Children's Day, Down on the Farm Day and Autumn Days. Set to open sometime in 2015, the Port of Ludington Maritime Museum will be a real showcase for the city. Housed in the former U.S. Coast Guard Station along the channel, the Maritime Museum will feature a panorama of Pere Marquette Lake, a replica of both the Pere Marquette 22 carferry pilot house and the Ludington North Breakwater Lighthouse, plus some interactive exhibits.